The trusty Pig, under the influence of a strong, energetic Scorpio, ceases to be a naive simpleton. The union of these two signs rewards its representatives with a complex, capricious character. Pig Scorpions are selfish, self-centered. They require attention from others, are jealous and suspicious: the whole world should revolve around their significant person. However, despite its frantic nature, this Scorpio is the quietest of all possible combinations. He knows how to like people, easily gets acquainted. Deprived of complexes, self-confident, cunning and careful, if necessary resorts to persuasion and flattery. In general, the Pig-Scorpio — an emotional, charismatic person, likes to be in the spotlight. Sociable, active Scorpions-Pigs rush to feel and hurry to live. They like to communicate, often chatting without stopping, than strongly bother people around. For them, calmness and silence is the most unfavorable situation of all possible. They prefer to act, not to rely on fate. Absolutely free from embarrassment, capable of extravagant antics. And in their own way right: thanks to their courage and energy, they easily achieve success in life. According to the combined horoscope Pig-Scorpio — an ambitious nature, strives for heights in the career, does not tolerate objections. This person achieves his every possible way, extremely incomprehensible in the choice of means. It is easy to get acquainted with the necessary acquaintances, in everything is looking for a profit for themselves. Greedy to new sensations Pig-Scorpions are not afraid to make bold decisions. These enterprising people are confident in their abilities, easily go to contact. Do not hesitate to ask for help, get along well with others. Moreover, they are so pleasant in communication that they do not cause negative emotions. Scorpions-Pigs are benevolent and generous people. They are attentive to their relatives, they know how to speak beautifully and speak a lot, they like to organize holidays. True, they carefully control their spending, they are not scattered with money. If you make an expensive gift, then this gesture is trying to attract attention to yourself or expect a reciprocal favor. At the same time they remain charming and charming people, attracting everyone’s attention. 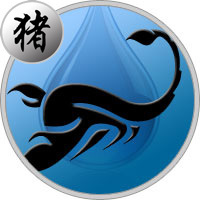 Scorpio-Pig is distinguished by irrepressible energy, thirst for knowledge and discovery. Curious, tiring, he is interested in everything in the world. Can not remain indifferent to all that is happening, conducts life in constant movement. With the same enthusiasm and working, and resting, always finds for himself an interesting and useful occupation. Likes to spend time in nature, with great pleasure engaged in gardening. Pig Scorpio is so talented that he knows how to do absolutely everything that is possible. This is a fine tailor, and an experienced gardener, and a talented organizer. In his hands, anything turns into a work of art. And so infectious in his desire to "embrace the vast", which easily finds associates. In a love relationship, the Pig-Scorpio is an attractive, intriguing person. Behaves as discreetly as possible, controls his feelings. Mysterious, unpredictable and even a little cold, but sooner or later he opens his heart to his partner. According to Scorpio-Pig’s love horoscope — sensual and temperamental partner. The nature of his sexual attractiveness is quite clear: the love of the Pig, coupled with the passion of Scorpio. So bright and charismatic that it is easy to achieve reciprocity. Family life with the Scorpion Pig is full of surprises and surprises. This person is rather capricious, demanding and intolerant of the partner’s shortcomings. All family members must follow his instructions, agree with any decision. He does not tolerate objections, he is jealous, selfish and resentful. Even if he tries to hide his discontent, this is not good for him. Scorpio-Pig — vengeful nature: find a way to punish relatives for disobedience. At the same time, he is generous and attentive to the needs of his half and children. Purposefulness and perseverance are the distinctive features of the Pig-Scorpio. It is peculiar to him to achieve his goal, regardless of any obstacles. Can not accept failure, will work until he gets what he wants. Ambitious Scorpio-Pig is born for great things, it’s a great organizer. He is able to manage people, although sometimes he is too zealous in his desire to lead. It can be rude, demanding and even vindictive, but only for the sake of the good of the cause. This ambitious person can succeed in any field of activity. It is important for him to take place in the profession. Sometimes he is so carried away by the pursuit of his dream that it spoils the relations with others. It attaches too much importance to material values, works hard to meet its needs. This obsession with his own business prevents him from soberly looking at things. Scorpio-Pig should correctly prioritize, he should not get carried away with the pursuit of money and career growth. Men of this sign combination do not tolerate peace and quiet, try to lead an active lifestyle. Too energetic to stay at home for days on end. Are full of the most different ideas and plans as it is possible to improve a life, and without hesitation give directions to others. The Scorpio-Pig man is a born-again boss, ready to take responsibility for a huge team. He does not like criticism and remarks, harshly suppresses any attempts to influence his decision. A temperamental Scorpio-Pig man is despondent to flattery and compliments, not indifferent to beautiful women. True, his chosen one should be ready for that over time, instead of a gallant, generous gentleman, a demanding, jealous husband may appear. These emotional women do not consider the necessity to restrain their feelings. They adore chatting on a variety of topics, dressing up and going to visit. Scorpions-Pigs women are bright, requiring attention. From the admirer await the refined courtships and magnificent gifts. Are not indifferent to beautiful things, do not know the measures in spending. They are easily offended, do not want to admit their mistakes. At the same time they are hardworking, they can be relied on. Scorpio-Pig can not hold back his resentment and jealousy, so her partner should be especially careful in dealing with other women. If he forgives betrayal, he will exhaust the life partner with endless quibbles. Will be happy with a man who does not pretend to be a leader in family relationships.